Well, as you can see, I bought a motorcycle. 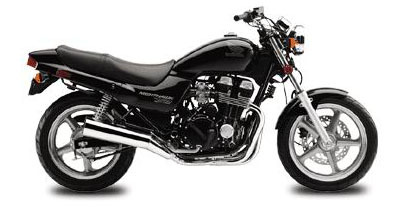 My bike looks exactly like the one in the picture except mine has a windshield. I will get pictures of mine up soon, but until then you can stare at this picture. I bought it on Friday and so far I am sticking to neighborhood streets. I plan on braving some more major roads fairly soon (43rd Ave, Bell Rd, Greenway Rd, etc.) as soon as I get more comfortable with my instinctual reactions while on the bike. Escrow was supposed to close on our house yesterday, but some stuff fell through with the lender. (They lost a document I faxed to them back on the 15th of June.) Also, the seller neglected to perform two of the repairs they agreed to. In addition, they apparently shampooed the carpet and then proceeded to turn of the a/c prior to the carpet drying. The result is a very pungent mildew odor that permeates the house. We are having a carpet guy look at it this morning and hopefully we can take money from the seller in order to fix this problem. Hopefully all will be resolved today and we will get the house today in a somewhat livable state.